2018-19 Federal Budget – what does it mean for refugees? The Refugee Council of Australia has produced an analysis of how the 2018-2019 Budget measures affect refugees and those seeking humanitarian protection. Jam for Refugees is a ten hour concert showcasing a series of 30-minute acts by some of Canberra’s finest musicians to raise both money and awareness to assist refugees. After the successful event last year, this one will be even better. Sausage sizzle & afternoon tea available. – Entry by Donation. FRIDAY 1 JUNE, 10.30 am to 8.30 pm, All Saints’ Church, Cowper St Ainslie. We are pleased to advise that CRS expects to reach its target of raising more than $30,000 for its scholarships program this year! This will be a wonderful outcome, and we acknowledge with thanks the terrific generosity of our members, their families and friends, and many other members of the public. The CRS Scholarships Team will now be focussed on preparations for the Awards Ceremony on Tuesday 19 June 2018 at 9.15am for a 9.30am start. Special guests at the Awards Ceremony will be the Minister for Multicultural Affairs, Ms Rachel Steven-Smith MLA, and Mr Thomas Albrecht, UNHCR Regional Representative. Mr Greg Bayliss, local ABC radio identity, has kindly agreed to act as MC for the event this year. The Awards Ceremony is a major event in the CRS calendar, held annually during World Refugee Week, and members and friends of CRS, along with all donors and families and friends of scholarship awardees, are warmly invited to attend. Chief Minister Andrew Barr will host an event this month to mark the inclusion of CRS on a plaque in the ACT Honour Walk in Ainslie Place in Civic. 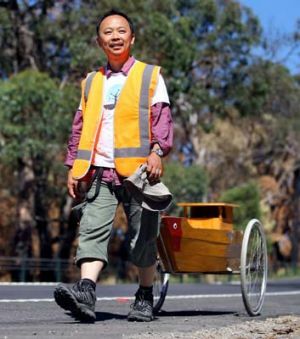 The ACT Honour Walk recognises individuals and organisations who have shaped the City of Canberra. CRS is being included in recognition of its contribution to providing the best possible start for refugees and asylum seekers in Canberra. This is a wonderful recognition of CRS and the contribution that all of its members have made over the years.